Finally, back to York for the last leg of our April trip. I know it’s been a while and I’m mainly relying on my notes but the Bierebelle has been ultra-busy, building her mountain bike, riding around on it, going on a hen-weekend, celebrating Brewdog’s fifth birthday…phew! So, the story continues back in York. Spirits were high in anticipation of my mum’s wedding. Hopes were also high. Would I finally lay my hands on that elusive Rudgate York Chocolate Stout? 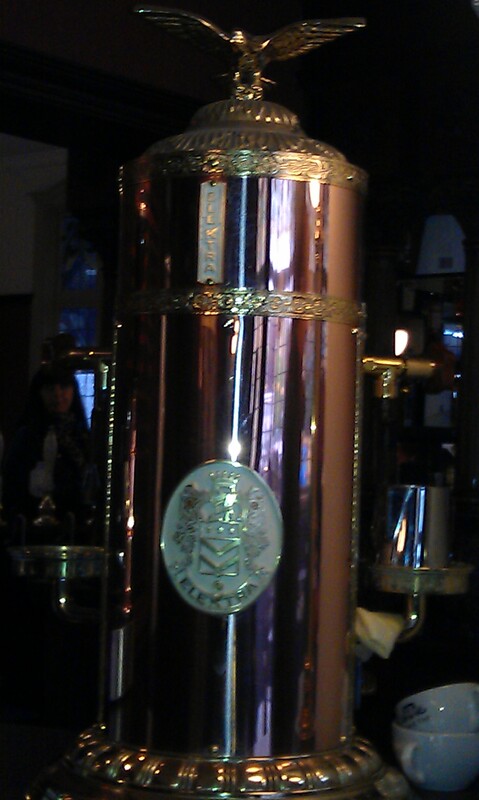 Naturally, the first stop was inevitably the York Tap as we waited for a lift from my dad. As regular readers know, this has become a must-visit place whenever I return to York. Although I dearly love the Sheffield Tap, the York Tap is a place is becoming my favorite of the two. As a York native, I find it remarkable that they have breathed so much new life into a premises that I had never really even looked at before. 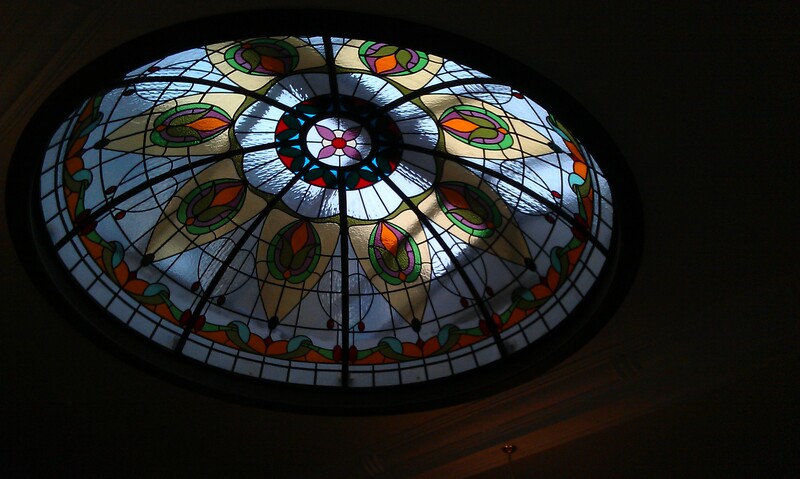 The lovingly restored art-nouveau features such as the elegant stained glass skylight, real working fireplace and the mahogany finishes take this up to the next level of railway pubs; it’s such a welcoming and lovely place there’s always a danger you could miss your train. The other danger which could leave you stranded, of course, is deciding which of the draft ales, beers and ciders to sample from their dizzying selection of 32 on the huge, round bar. By the time I’ve done a few rounds of that thing, I feel like I’ve earned my drink (although smart people look at the chalk board which I always remember when it’s too late). The coffee’s pretty awesome too- coffee nerds will understand what an awesome Electra this is! Since it was a fairly gloomy day, I was first drawn to the rather sinister-looking black and red pump-clip of Kirkstall Black Band Porter (5.5%ABV). This bewitching black brew had a spellbinding aroma of dark treacle-toffee with a scattering of raisins. The luxuriously thick liquid envelops the taste-buds in a burnt candy flavour with blackcurrants and a little black magic which stays with you for a long finish with a hint of smoke. The seductive warming sensation and dark malt will wrap you up in velvet darkness, making the rain at the window seem a million miles away. Not quite ready to leave the darkness, I discovered the Whitby Black Dog Brewery’s Rhatas (4.6%ABV). From the homeland of Bram Stoker’s Dracula, comes this chocolate brown beast whose bite is not really as sharp but still it’s a good stab at a dark bitter. Slightly unusual in it’s spicy brown bread flavour, it’s not as sweet as the Black Band porter but still gives way to a round vanilla finish at the end. Quite quaffable and a nice run-up to the much brighter, vibrant Chateau Rogue Oregasmic (7%ABV). Just as the sun was starting to peer through the clouds, I felt like I had the chance to taste a little bit of summer. The cloudy burnt orange echoed the late-afternoon glow and left a pretty halo on the sides of the glass. The exotic fruity aroma suggested pineapple and sunny skies and the initial sharp, vibrant flavour was enough to drag the tastebuds out of their languid darkness. The long, bitter finish is punctuated with mouthwatering pineapple-cube zinginess. Oregasmic is a livewire that keeps on twitching with flavours; getting further down the glass, toffee, bannana and pecan were all hopping around before a tangly-tingly-tongue finish.